With options ranging from coffee, coconut, and avocado to pineapple, papaya, and passionfruit, the list of boba tea flavor combinations that you can enjoy is nearly endless. Because of the varieties available, many people don’t know what goes into the original boba tea. Continue reading to learn about the traditional ingredients of this popular beverage. As you probably guessed, tea plays an important role in traditional bubble tea. Boba tea originated in Taiwan, and Taiwanese black tea was used to create the beverage. Today, boba tea houses use other types of tea as well, and some boba tea varieties include no tea at all. For example, fruit flavored boba teas are sometimes made using fruit juice and may not contain tea. If you’ve never tried boba tea before, then you’re probably curious about the spheres that sit at the bottom of a cup of this drink. The chewy spheres, which can be dark or light and sweetened or flavored, are tapioca pearls, also known as boba, from which the beverage gets its name. One of the most loved features of boba tea is how sweet and delicious the beverage is. Sugar, honey, and flavored syrups are some popular boba tea sweeteners. Sweetening boba tea can balance the bitterness of the tea base that it’s made with and enhance whatever flavor you select for your drink. 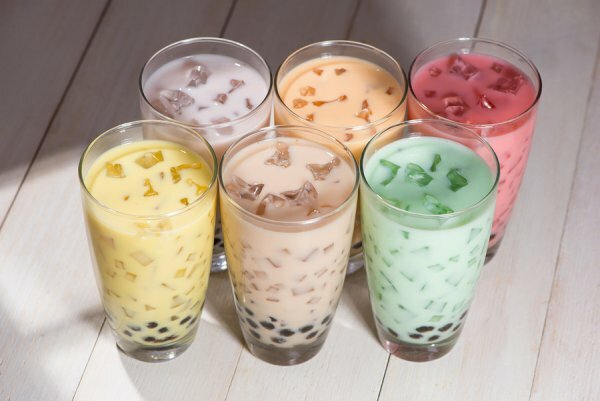 You may have noticed that some types of boba tea are translucent while others have a creamy appearance. Typically, fruit-flavored boba teas do not use creamer. On the other hand, options like red bean, taro, pudding, and coconut often include ingredients like milk, soy milk, half and half, or powdered non-dairy creamer to enhance their flavor and give them a milky consistency. At Happy TeaHouse & Café , our drink menu includes a wide selection of bubble teas for you to enjoy. For more information, please contact our tea house in Houston by calling (713) 469-3275.